Sen. Kirsten Gillibrand, D-N.Y., speaks at a news conference on Capitol Hill, Dec. 6, 2017. Gillibrand and fellow female Democratic senators have united in calling for Sen. Al Franken to resign amid sexual misconduct allegations. Also pictured are Rep. Cheri Bustos, D-Ill., and former Fox News host Gretchen Carlson. Twenty-eight Democratic U.S. senators, including 13 female lawmakers, on Wednesday called for their party colleague, Senator Al Franken, to resign in the face of mounting allegations that for years he made unwanted sexual advances on multiple women. Senator Kirsten Gillibrand of New York was the first to say that the 66-year-old Franken should quit. He was a popular television comedian before twice winning Senate elections in the midwestern state of Minnesota. But her call for Franken's resignation was quickly followed by the same demand from other Democratic female senators, including Mazie Hirono of Hawaii, Maggie Hassan of New Hampshire, Kamala Harris of California, Claire McCaskill of Missouri, Tammy Baldwin of Wisconsin, Heidi Heitkamp of North Dakota, Patty Murray and Maria Cantwell of Washington, and Debbie Stabenow of Michigan. "As elected officials, we should be held to the highest standards, not the lowest," Gillibrand said. "The allegations against Senator Franken describe behavior that cannot be tolerated. While he's entitled to an Ethics Committee hearing, I believe he should step aside to let someone else serve. FILE - Sen. Al Franken, D-Minn., speaks at a hearing on Capitol Hill in Washington, Nov. 15, 2017. Harris said, "Sexual harassment and misconduct should not be allowed by anyone and should not occur anywhere. I believe the best thing for Senator Franken to do is step down." Senator Bob Casey of Pennsylvania said, "I agree with my colleagues who have stepped forward today and called on Senator Franken to resign. We can't just believe women when it's convenient." He was joined by other male senators, including Sherrod Brown of Ohio, Joe Donnelly of Indiana and Ed Markey of Massachusetts. 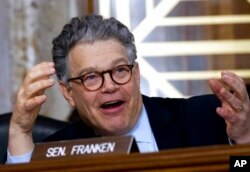 Franken had no immediate response to his Democratic colleagues, but said he would make an announcement Thursday. As the sexual misconduct accusations against him mounted in recent days, he at various times has apologized, denied the allegation or said he did not remember specific incidents. The sexual misconduct allegations against Franken were touched off last month when Leeann Tweeden, a Los Angeles radio show host and former model, said that Franken, when both of them were on a 2006 tour to entertain U.S. troops in the Mideast, attempted to forcibly kiss her. Later, she said that when she was sleeping on a military aircraft returning to the United States, Franken groped her breasts, posting a picture of a smiling Franken as evidence. That was two years before Franken was first elected as a senator, but since then, several women have said Franken groped them when they posed for pictures with him at public events. The calls for his resignation came swiftly after a former Democratic congressional aide told the Politico news site that in 2006 Franken tried to forcibly kiss her after a taping of his radio show. The woman said she ducked to avoid Franken's lips, but he said, "It's my right as an entertainer." In her statement, Senator Cantwell said, "Senator Franken's actions are disturbing, egregious, and demonstrate a pattern of serious misconduct and abuse. It is time for Senator Franken to resign from office." The demands for Franken's resignation came a day after the longest-serving member of the House of Representatives, Congressman John Conyers, an 88-year-old Michigan Democrat, quit in the face of sexual misconduct allegations against him. House leaders, both Democrats and Republicans, had called for his resignation after several women who worked for Conyers accused him of unwanted sexual advances over several years. Allegations of sexual misconduct have roiled the United States for weeks, with dozens of powerful men in the world of politics, business, entertainment and the media losing their jobs after women have come forward with graphic details of how they were abused.